This coming Sunday, the Fifth Sunday of Great Lent, we commemorate St. Mary of Egypt. I really love St. Mary and the story of her very sincere and deep repentance as well as her amazing life of asceticism. It's no wonder she is commemorated in the Orthodox Church during Great Lent, a time of repentance and spiritual renewal. Her story has many elements that children find interesting (especially the lion!). St. Mary lived a very sinful life before her conversion. Therefore, it can be a somewhat delicate task to tell her story to children in a way that is appropriate for them while at the same time conveying the depths of her sins from which she repented. I searched online for a children's book or story about the life pf St. Mary of Egypt. I still haven't found any storybooks about her life for children, but I did run across a re-telling of her life for children posted on her feast day (which is April 1). It can be found here along with some lovely icons that help tell her story. I read the story to my children and showed them some of the icons. They were particularly interested in the lion and her miracle of walking across the Jordan river. We talked a bit about how sorry she was for her grave sins and why she chose to live a life of extreme asceticism in the desert (as a form a deep and humble repentance, to keep herself from returning to her old ways and to become closer and closer to God). We also talked a bit about Fr. Zosimas' pride and his sincere humility after meeting St. Mary. I asked my kids what part of St. Mary's story they found the most interesting. My daughter said the part where Mary was unable to enter the church on Jerusalem was most interesting to her and my son was most fascinated by the fact that she lived so long alone in the desert. For our project I decided to have the kids draw a picture depicting Fr. Zosimas and St. Mary with simple figures in the Waldorf style. We used watercolor pencils (I have a set I have been wanting to try out so I thought this would be a good project for that!). We used two particular icons (see above) as inspiration for our drawings and I encouraged the children to either depict Fr. 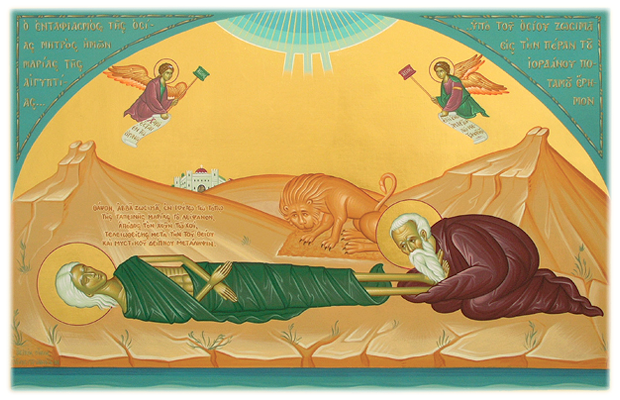 Zosimas with the reposed St. Mary (and the lion nearby) or St. Mary coming across the Jordan river to receive communion. I made a quick drawing as an example for them. After they completed their drawings I showed them how they could dip a paintbrush in water and go over parts of their painting with the brush to make it appear like a watercolor painting. I think the effect and the resulting pictures are lovely. A note on paper: After a trial run, before I did the project with my children, I decided to use watercolor paper. I first tried the project with an 80# drawing paper, but with the water it made the paper wrinkle up too much. The heavier watercolor paper worked much better.